Set one or more hanging feeders in trees where birds spend time. birds flying over may notice. a birdbath with string or wire to catch birds’ attention. have a spot where you can place it where it won’t be an eyesore. a wide variety of birds. dropping from many feeders onto the lawn. switch to them when they are inundated with starlings or House Sparrows. 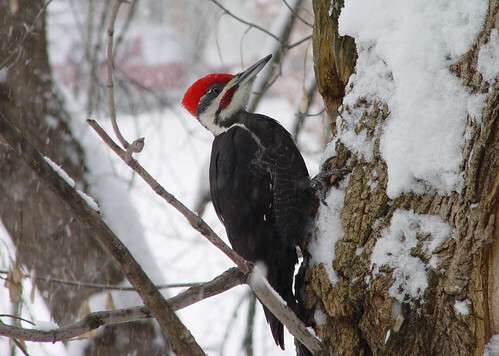 You can take great photos of birds with a cellphone or point-and-shoot camera. The secret? Get close! Here’s how! No matter what kind of camera you have, the closer you can get to a bird, the sharper, brighter, and bigger your image will be. 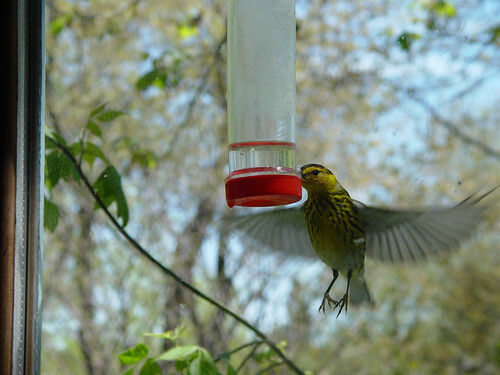 The best place to practice getting close to birds for photography is often your own backyard. But how do you sneak up close to birds that can fly away at any moment? The best way is for you to be there first, hiding so that the birds don’t even realize you’re around. There are often photographic blinds—small wooden buildings with windows for cameras—in wildlife refuges and other places where animals gather, but few people have the means or interest in building a permanent structure in their backyard. 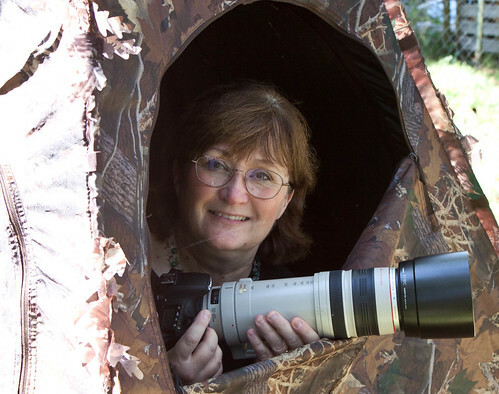 Many wildlife photographers set up portable commercial blinds, looking like small camouflaged tents, near feeders, nests, or other places they’re sure to see birds close up. If you don’t have a commercial blind, you can make your own with any tent, or even just covering yourself with a sheet or blanket wrapped so your camera is the only thing visible. We can sometimes get decent photos of birds through window glass, especially when we have a feeder on or very close to the window. Photos taken this way can sometimes turn out well, but the glass tends to soften the image, and depending on the camera, it can be tricky to focus properly. It’s important to clean the window often if you use this method. Usually you’ll get better photos by opening a side window and shooting from there. It can be tricky keeping birds from noticing us, though. 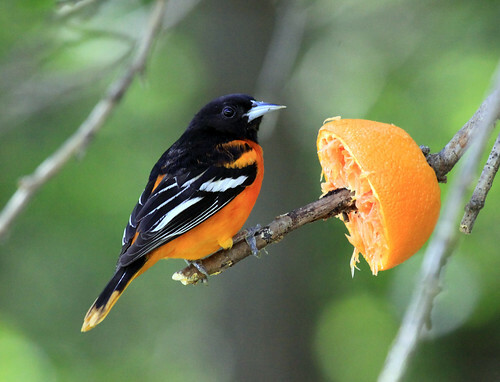 If your camera has a way of shooting remotely, such as a cable or electronic shutter release, you can set the camera up on the feeder, or on a tripod near where you know a bird is going to perch, and wait out-of-sight until the bird shows up. It’s tricky to get good photos of birds, even when we’re very close. Thanks to digital cameras, we can quickly delete any bad pictures, and with practice, more and more of them will turn out great! The Black-capped Chickadee, state bird of Maine and Massachusetts, is tiny, endearing, and surprisingly tame. It’s one of the easiest of birds to attract to suet or seed feeders and nest boxes throughout its extensive range. 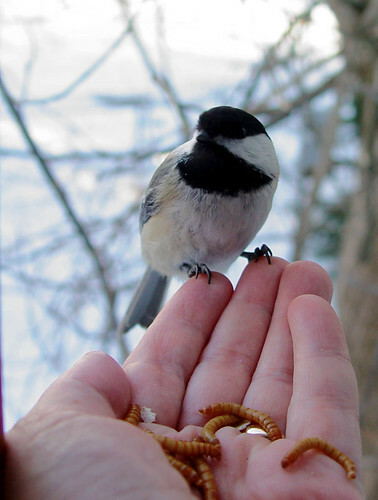 With practice and patience, a chickadee may even eat out of your hand! Our November Bird of the Month is one of the most endearing birds in the world: the chickadee. Chickadees are tiny, plump, and big headed, giving them a baby-like shape that probably contributes to our sense of their “cuteness.” But their adorableness comes from more than mere appearance. More than most wild birds, chickadees pay close attention to us and quickly learn to associate us with our bird feeders. They look us in the eye, and many learn to take sunflower seeds and special treats, especially mealworms, right from our hands. 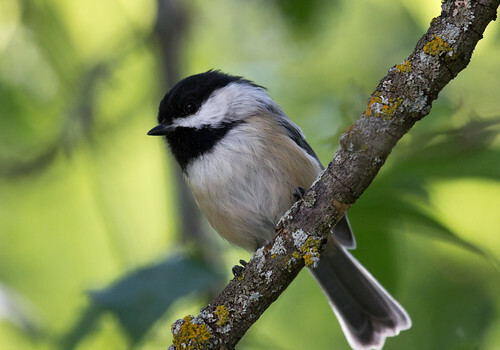 Chickadees are among the most intelligent and adaptable of all birds, able to eat a wide range of insects, seeds, and fruits, and so can be found in a wide range of habitats ranging from wilderness to heavily urbanized metropolitan areas, wherever they can find trees. 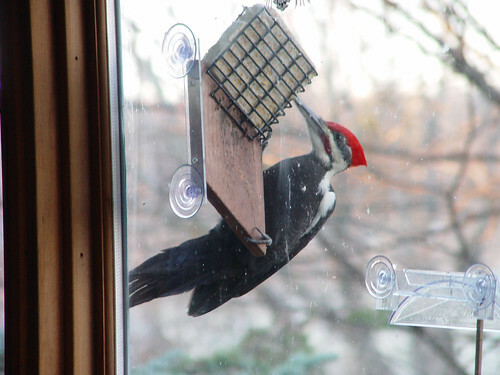 They even peck on windows to catch our attention when a feeder is empty. 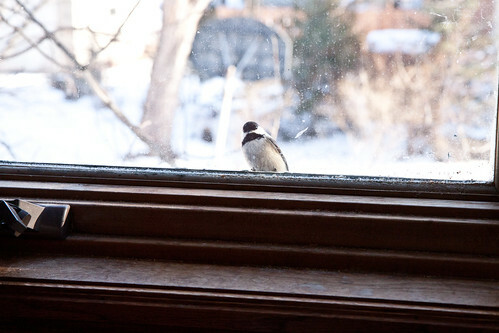 Humans are not the only species drawn to chickadees. From summer’s end and through winter and early spring, chickadees welcome a host of other kinds of birds into their sociable little flocks. 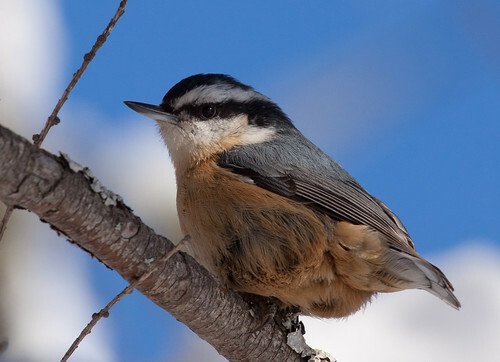 Nuthatches, creepers, kinglets, vireos, warblers, and even some woodpeckers hang out with chickadee flocks. All these little birds feed on insects or, at feeders, suet. The many birds together are more likely to spot predators and other dangers than any of them could do alone. The adult chickadees forming the nucleus of these flocks join together in late summer and early fall as they complete childrearing duties for the year. As young chickadees grow independent from their parents, they scatter, each sibling joining a flock separate from both its parents and its other siblings. This ensures that when these young birds pair off in spring to start raising their own families, they’ll be unlikely to choose a sibling as a mate. Most of these flocks include 3 to 12 individual chickadees. Chickadee flocks wander from one good feeding spot to another throughout the day, within a feeding area about 25 acres or so in size. Flocks tend to gravitate to the most reliable food sources first thing in the morning and before going to roost in the evening. One or more of these flocks may pass through our yards on and off throughout the day. 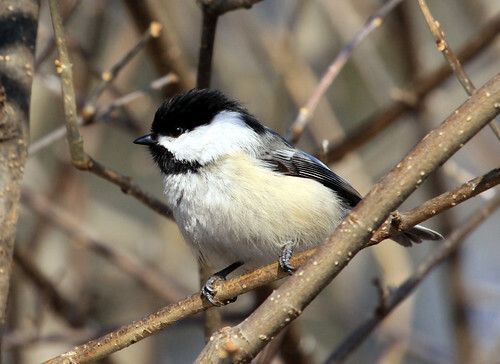 Seven species of chickadees live in North America. 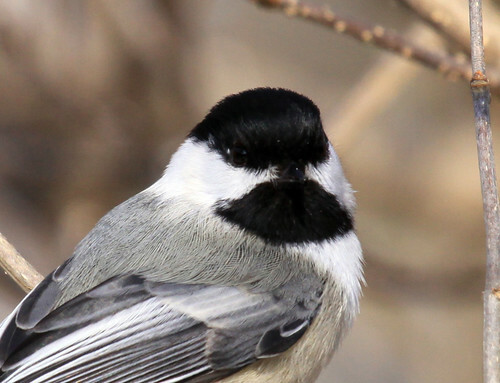 The most widespread is the Black-capped Chickadee, found in the northern 2/3 of the US and much of Canada and Alaska. 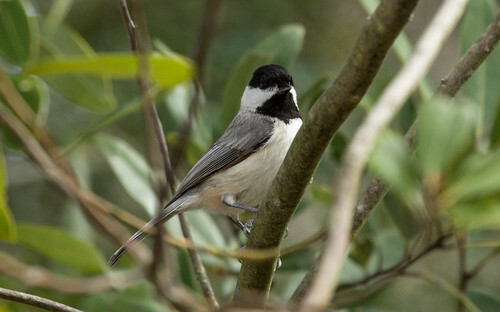 The Carolina Chickadee is found in the southeastern quarter of the Lower 48, down to the northern half of Florida. 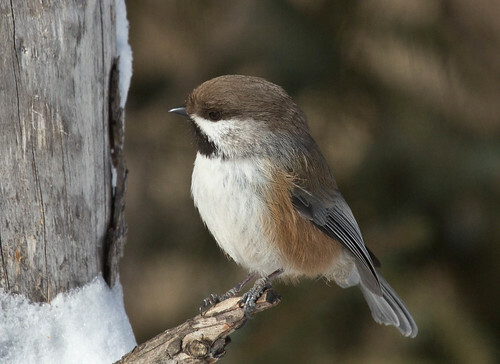 Mountain Chickadees are found in mountainous areas from northern Canada to the Mexican border. Chestnut-backed Chickadees are found along the Pacific coast from Alaska through central California as well as inland in a few western areas. 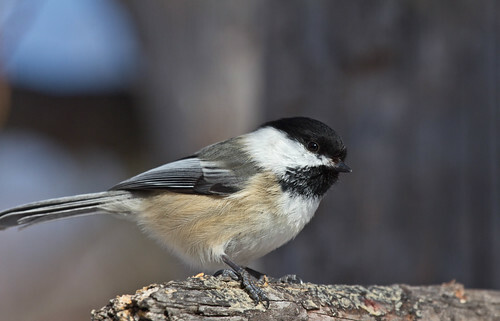 Boreal Chickadees are widespread in Canada and Alaska, reaching the northernmost tier of states. 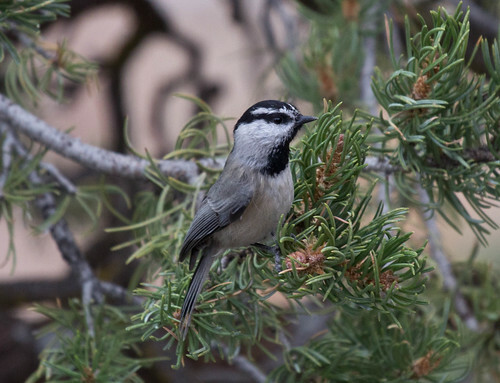 The Gray-headed and Mexican Chickadees have much more restricted ranges in North America. The Gray-headed Chickadee is found only in northernmost Alaska and extreme northwestern Canada. The Mexican Chickadee is fairly widespread in Mexico, but reaches the United States only in a very small area in the Chiricahua Mountains in Arizona and in the Animas Mountains in New Mexico. The Wild Bird Club Special Offers and Exclusives section has a typo. Change Blub to Club. Animated gif at top with all the lovely bird portraits—there are at least seven that are not American birds. This really should be changed. The one thing I’d change in this text is to make it a “playful jay,” not a “playful finch.” Finches aren’t known to play, and jays actually are. I’m not sure what activity here you’re thinking of—is this something Cornell has already put together? Our Beginner’s program has tips for id’ing birds, the best natural sites to find birds and useful info to get you started. Black-capped Chickadees are plump, with long, narrow tails, big white cheeks and a black cap and bib. White-breasted Nuthatches are also plump, with a black cap and white cheeks. But they have a white throat and a very short tail. They often have rusty feathers on their lower sides and beneath their tail. They often perch upside down. Red-breasted Nuthatches are plump and have a short tail and black cap. They’re smaller than White-breasted Nuthatches, and have a conspicuous eye line, so no conspicuous white cheek. They have a whitish throat and rusty underside. They often perch upside down. 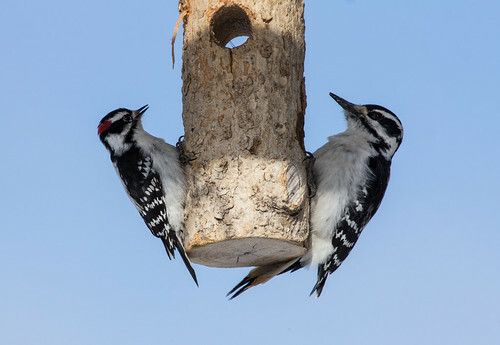 Downy Woodpecker (left) and Hairy Woodpecker (right) are almost identical black-and-white woodpeckers. The Downy is smaller and has a proportionally smaller beak. The Hairy is larger with a proportionally longer beak. You can learn how to identify these and many other birds, and learn about their lives, too, at All About Birds (http://www.allaboutbirds.org/guide/search). Learn the parts of a chickadee. See if you can find all these labeled parts on a chickadee. 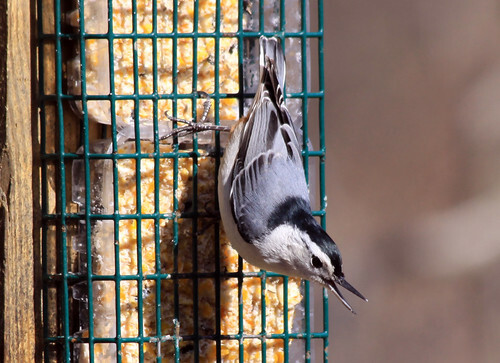 When chickadees visit our feeders, they arrive in small flocks. 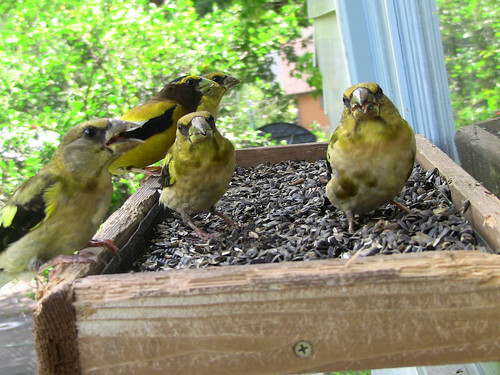 But they don’t feed side by side as finches do, so they’re tricky to count. One may be eating suet, another grabbing a seed, two may be waiting in a nearby tree for their turns getting their own seeds, and three more may be in different trees or shrubs eating seeds they already took. How can you count them all? If you can stand outside while your flock is around, you may notice when one or more start making a tsleet call. That’s the sound that seems to mean “I’m outta here!” as they move on to a new feeding area. The birds will leave, one by one, all moving in the same direction. You may have to try counting them several times before it gets easy. Many chickadee flocks work out a daily pattern, and will leave your yard in the same direction time after time. Sometimes two or more different flocks of chickadees come to the same yard at different times. If your chickadees fly one way some of the time and in another direction at other times, you may be watching two entirely different groups. You’ll know this for sure if you count a different number when they fly in one direction than when they fly another way.